If you have a completed design and know exactly what kind of sign you want, use this option. Starting from scratch? No problem. Use our SignMagic program to design your custom sign. Know what you need and want a price? Sometimes it's just easier to talk to us directly! Finally, a signboard that does not rust or decompose! 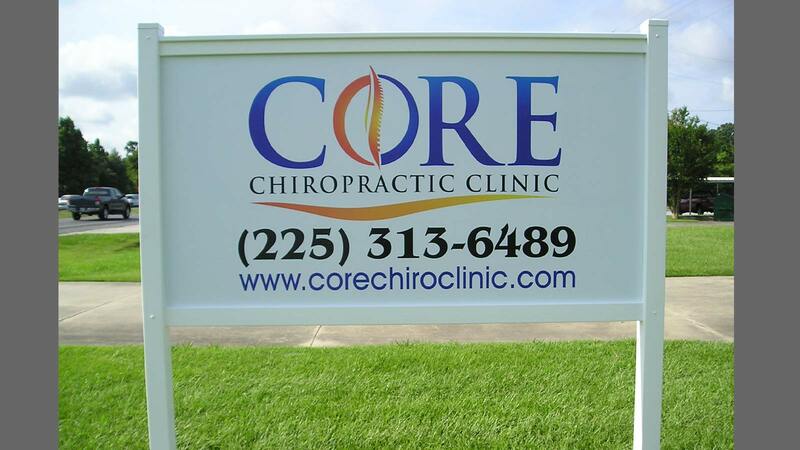 Light-weight yet strong, aluminum signs are one of the most durable sign materials available anywhere. 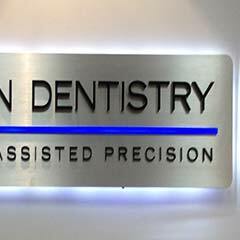 When you are looking for a perfectly smooth finish, an aluminum sign projects a premium quality image. Plus, a custom aluminum signok can never rot or deteriorate like a standard wooden sign. You can choose any color you want. Our online aluminum sign pricing tool instantly calculates the exact prices on custom aluminum signs, shows you quantity discounts, and even lets you compare this product to other metal sign alternatives! And don't forget…at SignsUS, shipping for aluminum signage and all other indoor and outdoor signs is free for orders within the continental US greater than $50 for ground and greater than $400 for freight, and orders outside the state of South Carolina are tax-free! You can now choose from ANY color under the sun when designing your new signage. You can even choose a reflective color! Specialty aluminum finishes including brushed gold, mirror gold, brushed silver or mirror silver are available in a standard .040" aluminum thickness. 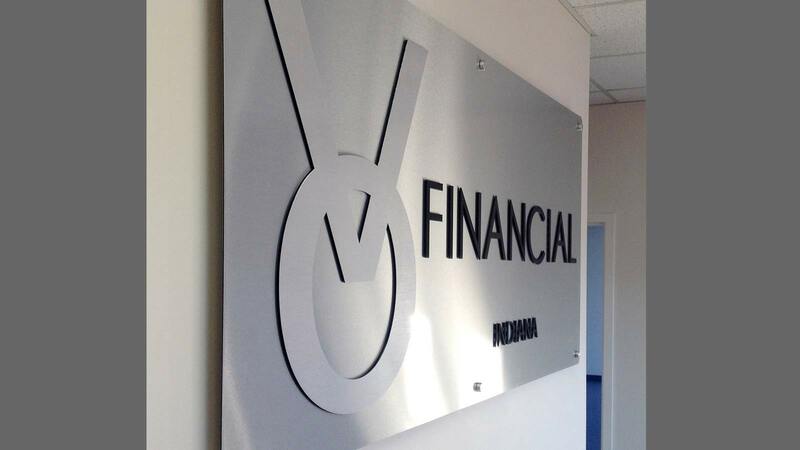 If you'd like a thicker sign in these finishes, they are available in our Dibond sign material, which is made up of two aluminum sheets on either side of a solid plastic core. While most sign companies are setting limits to what size your aluminum sign can be, we are printing aluminum signs in every size imaginable! 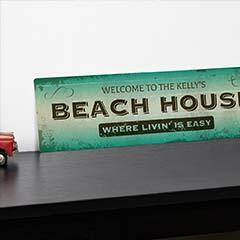 Aluminum signage from SignsUS comes in sizes up to 6' x 12' in a single, seamless sheet. This is the very largest, rigid, seamless sign panel available in the market today. If you need a sign that is larger than that, no worries! Just let us know, and we'll make sure to get you any size aluminum sign you need. We custom cut more shapes for aluminum signs than any other sign company! Unlike most sign companies who only make standard shaped metal signs, SignsUS will cut your aluminum signage to ANY custom shape you desire! We cut uniquely shaped signs daily! Pictured below are a few custom sign shapes to get your creative juices flowing. 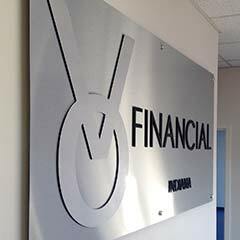 If you need an aluminum sign in an even more unique shape, just let us know. We'll make sure you get exactly the custom sign that you need! Displaying aluminum signage is easy! We offer installation kits and accessories that will help you mount your new sign to wood, metal, stucco, brick masonry or concrete! 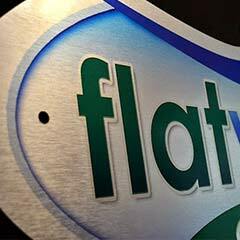 If you choose to simply screw your Aluminum sign into the wall, we offer screw caps to hide exposed screw heads and give your sign a more professional or "finished" look. We also offer a wide variety of A-Frames, also called Sandwich Boards, that make displaying your aluminum signage easy. Or if you'd like to hang your aluminum metal sign, just let us know. 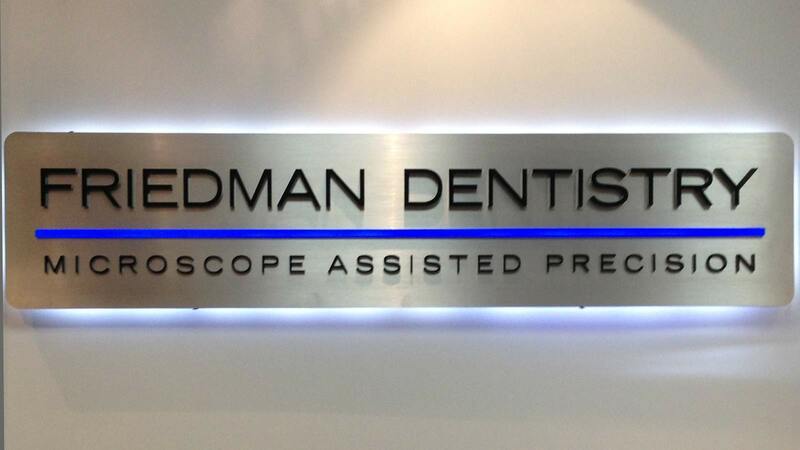 We can drill holes to the top of your sign to simplify the hanging process! "I just wanted to write and let you know that your website made it easy for me to design a sign, my final design draft was sent for my approval very quickly, and my sign shipped so fast and got here in plenty of time for my anniversary. The whole process was pleasant and efficient, and your customer service is great. I will order from you in the future when I need another sign. Thanks again for your great service." "Your company's ordering process was smooth, and we are very satisfied with the signs you produced for us. I can say that I searched for our needs via the web for a few days before coming across your site. I found it very easy to understand what I was getting from you and all communication was excellent. Again thank you for your time and product." Here at TheSignChef.com we are always trying to provide you with all the information you need to make the correct sign choice. Below are a collection of videos specific to aluminum and its options as well as outstanding qualities. You can find videos on size, thickness and shape options. If you have any questions after viewing please feel free to contact us. We will be happy to assist with any of your needs. Aluminum Signs- Can You Really Get Any Size Aluminum Sign? 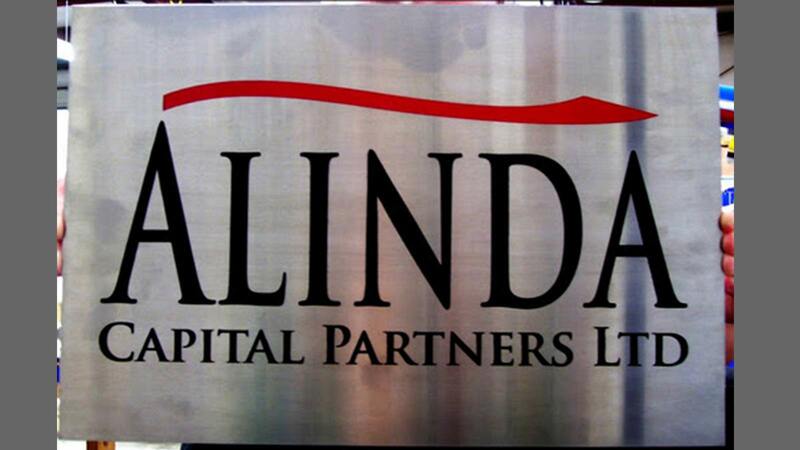 Aluminum Signs- What Shapes are Available For Aluminum Signs? 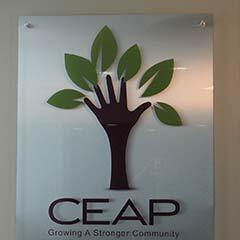 Aluminum Signs- What do Aluminum Signs Look Like Up Close? "What are the most popular sizes for custom aluminum signs?" Since real estate agents and contractors buy so many aluminum yard signs, one of the most common sizes is 18" height x 24" width. 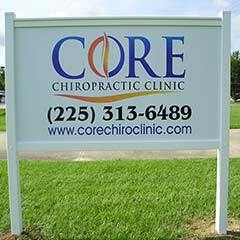 We stock real estate sign frames which accommodate a 24" height x 18" width aluminum sign panel as well. • 2' height x 4' width. The sizes above fit into a sturdy angle iron step stake for a convenient and portable display. But you should strongly consider upgrading the thickness of your custom aluminum signs for these larger size signs if you are in an area with seasonally high winds. The thicker the aluminum, the less likely aluminum signs will buckle or be ripped from the bolts which attach the sign panel to its sign frame. Increasing the thickness of your custom aluminum sign from a standard .040" to a medium duty .063" or extra heavy duty .080" gauge aluminum will enhance the durability of your aluminum signs. Generally, the larger the aluminum sign you want, the thicker the metal material needs to be. 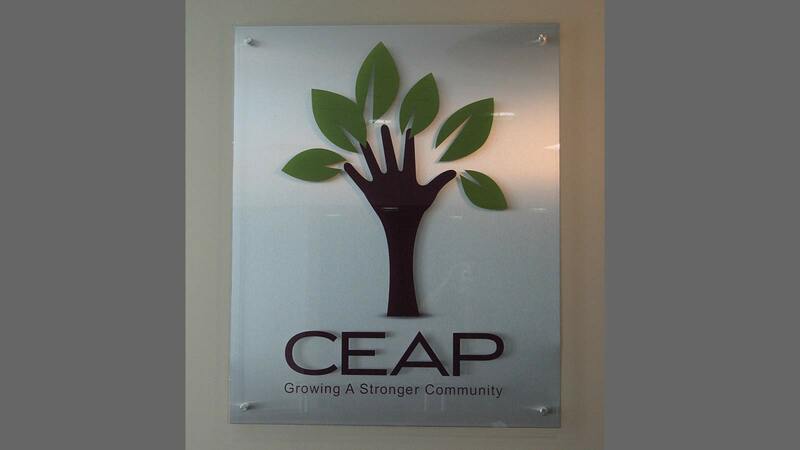 "Which aluminum sign material thickness is best for custom building signage?" One of the most common thicknesses for sign applications is .040" gauge aluminum. This thickness is ideal for standard, 18" x 24" real estate yard signs and is also the recommended thickness for 2' x 3' metal step-stake frames. When attaching aluminum signs to buildings, use 040" gauge aluminum for signs in size up to 2' x 4'. Technically, you can use .040" gauge aluminum for sizes all the way up to 4' x 10' provided you mount the metal flat against a wall. But the larger the panel size is, the greater the tendency to bend which can cause a large thin gauge aluminum sign to have a slightly wavy or rippled appearance when installed on a building, especially a corrugated metal building. Therefore, when you want a bigger sign, we recommend increasingly thicker gauges of aluminum with the optimum heavy duty thickness being .080" gauge aluminum. Other thicknesses available include 063" medium duty thickness and .050" lighter duty material. On smaller size signs (up to 2' x 4') even a modest increase to .050" gauge aluminum substantially increases the stiffness and rigidity of the sign panel. 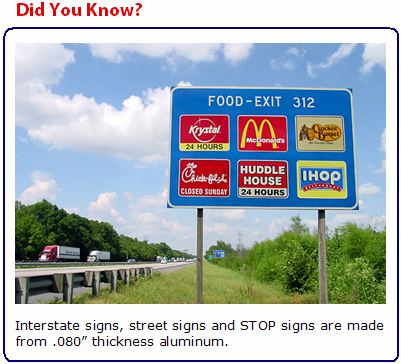 "What is the recommended thickness for hanging aluminum signs?" 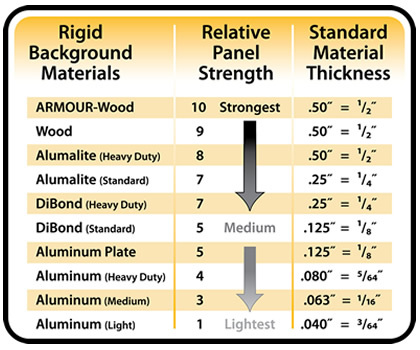 Aluminum .063" thick signs are best for hanging from a post such as 2' x 2' and 2' x 3' and .080" gauge aluminum works best for heavy duty applications such as 3'x 4' hanging signs, 3' x 3' Signs on a post or in a frame and larger signs. In general, as you go larger in size, we recommend that you increase the thickness of the aluminum sign panel you purchase. When in doubt, better to go too thick than too thin because the heaviest .080" gauge aluminum we stock is still less than 1/8" thick. 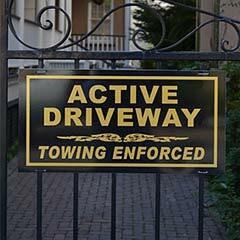 "What are some common uses for aluminum signs?" Aluminum signs can be used in many places indoors or out. Most frequently they are hung on wall, both interior or exterior. This makes the flexibility of the sign a non-issue. "What is the life span for custom aluminum metal signs?" The Aluminum material itself will outlast the artwork on your sign. 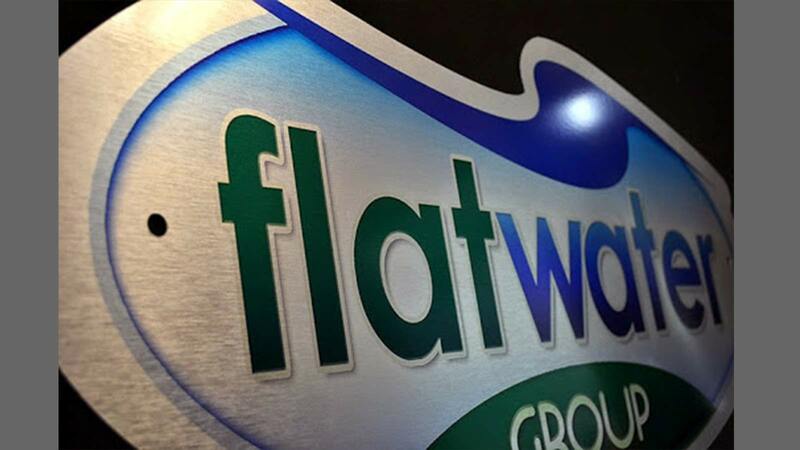 Our uncoated Economy Grade Signs are rated for at least 3 years outdoors while our Premium Grade Signs coated with an optically clear, UV Protective Lamination are rated for a minimum of 5-8 Years outdoors. Aluminum signs can last for decades indoors. "Are there other types of aluminum signs available?" 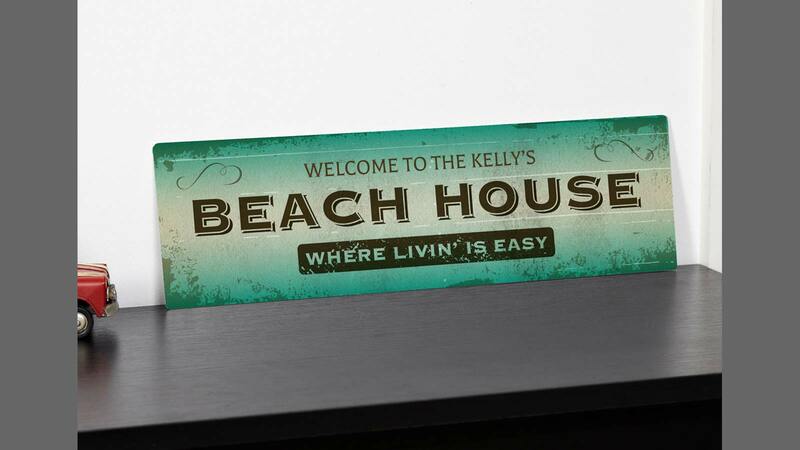 Aluminum is a solid metal sign material with a baked on enamel finish. 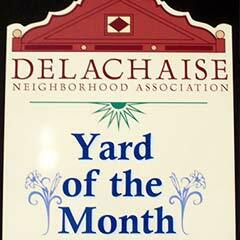 Aluminum signs are extremely durable in high traffic, wet and heavy equipment areas. 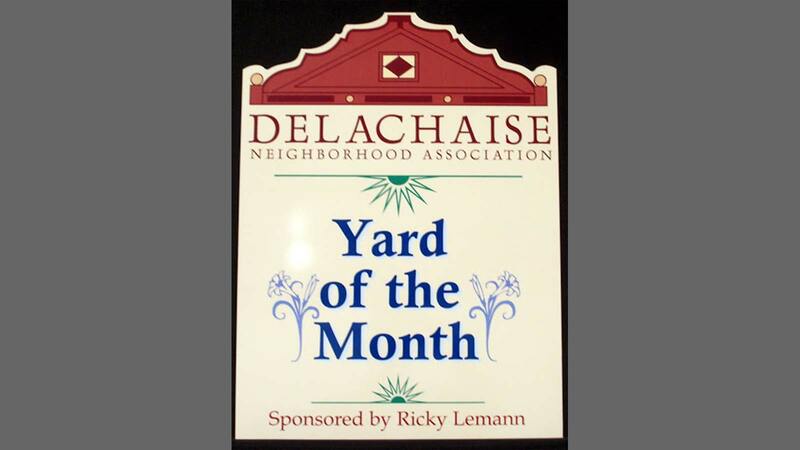 Aluminum signage is available in three grades from standard .040" gauge for real estate yard signs, to medium duty, .063" gauge, and to heavy duty, .080" thick aluminum. Alumalite is a corrugated plastic sign with an aluminum sheet re-enforcing either side. Alumalite is a rigid sign panel that is a little easier to handle and install than the thicker, heavier ARMOUR-Wood signs. It doesn't have quite as much panel strength as ARMOUR-Wood, but is still a highly durable product. Dibond is an aluminum sign with a solid plastic core. It is a lighter weight, rigid sign panel ideally suited for wall mounted signs, smaller post mounted signs and hanging signs. When you are looking for a product that is substantially stiffer than standard gauge aluminum signs, Dibond is a solid choice. ARMOUR-Wood is much stronger than traditional aluminum signs because it is reinforced with a wood shel. It is the strongest of all the rigid sign panels. 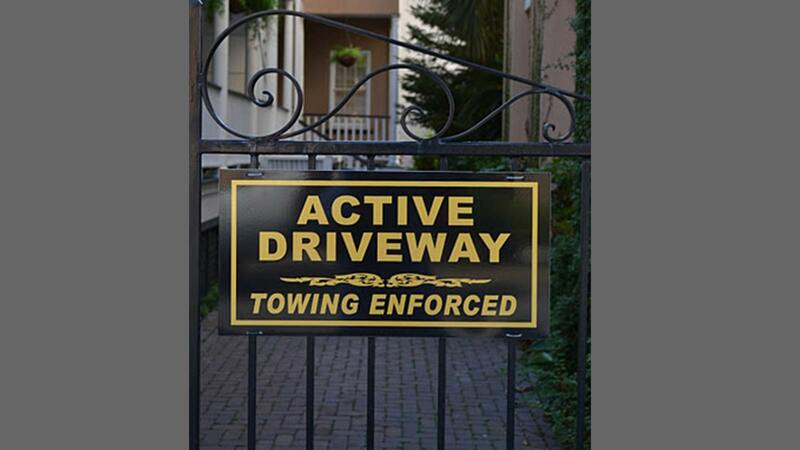 "Are custom aluminum signs suitable for installation between two posts?" "How far away will the vinyl letters on my custom signage be visible from?" "How can I use SignMagic to price my custom aluminum sign?" Using SignMagic Online Aluminum Sign Design Center, Step #1 allows you to choose the size area which most closely matches the space you have available. "How do I know that my custom aluminum sign will turn out the way I want?" Are you concerned that your custom aluminum sign may not turn out the way you want? After all, we are probably hundreds of miles away from you, so how can you be certain your order will turn out right? Fortunately, it only takes seconds to transmit full-color custom aluminum sign designs from our computer to yours because e-mails travel so fast these days. If you have any changes, we will e-mail you proofs as needed until you’re completely happy with your design. 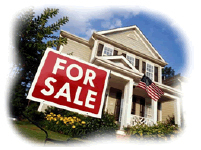 "Do you offer any buyer protection guarantees?" Sometimes, we make mistakes. We are only human after all. But it's how a business handles mistakes that counts, wouldn't you agree? So if we do happen to overlook something on your order, we will bend over backwards to make you happy. 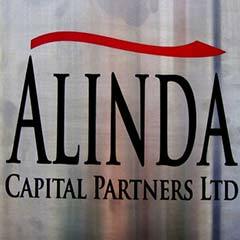 We stand behind our work with a 100% Customer Satisfaction Guarantee. We will promptly replace any product that is defective in workmanship or that is different from what you approved. And for your trouble, you'll even get a very pleasant surprise gift.